View of South China Sea The Philippines calls the South China Sea the West Philippine Sea. Parts of the Spratly Islands---which the Philippines calls Kalayaan, or freedom---lie just over 100 miles from the Philippines but are more than 1,000 miles from China. The Philippines has lead the effort to unite Southeast Asian nations against what it calls China’s illegal “grab” of most of the South China Sea. In the South China Sea the Philippines controls five tiny islands, two reefs and two sandbars. Pagasa is a Philippine-controlled island in the Spratlys with a population of 50 and a small garrison. 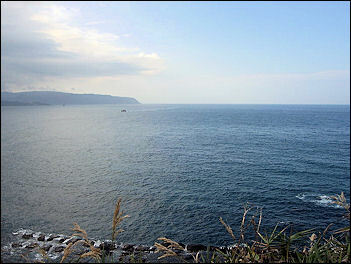 China accused the residents of the island of trespassing on Chinese turf. Although tiny and a large part of it made up of a single gravel airstrip, the island is the biggest in a cluster that the Philippines claims as it own and calls Kalayaan group of islands. The Philippines has proposed that the territorial dispute be resolved through the International Tribunal for the Law of the Sea. It also has strengthened military ties with the United States---which recently unveiled a new defense strategy that places greater emphasis on Asia---through such measures as conducting joint military exercises. China has been particularly keen to thwart efforts by the Philippines and others to exploit resources it wants for itself. The Philippines claims Chinese naval vessels have fired warning volleys at Filipino fishermen, harassed an oil exploration vessel and put up markers on Philippine waters in 2011 year after China outlined its "9-dash claim" to the sea in 2009. In the spring of 2011 Chinese naval vessels harassed a seismic survey ship working for Forum Energy, a British firm looking for oil under contract with the Philippines. After two days of near-collisions, the Philippines government sent out a small military plane to fly over the area.”Fortunately, the Chinese withdrew,” Lt. Gen. Juancho Sabban, the commander of Philippine military forces said. A new round of surveys is due to start early next year, setting up another potential confrontation. Panuba Filipino officials said that Chinese forces had intruded into Philippines-claimed areas around the Spratly Islands six times between February and June 2011, firing shots at least once at Filipino fishermen. China denied the allegation. Beijing said it would use violence only when attacked. In February, Manila accused Chinese naval ships of harassing an exploration ship near Reed Bank, an area 80 miles (130 kilometers) west of Palawan province. In March 2011, the Philippines scrambled military aircrafts after Chinese patrol boats harassed a Filipino oil exploration vessel in the South China Sea. In May. The Philippines said the Chinese Navy erected iron poles and placed a buoy on a reef in the Spratly Islands. According to AP, Philippines President Benigno Aquino III insisted that the Philippines won’t be bullied by China in a territorial spat over the Spratly Islands and that Beijing should stop intruding into waters claimed by Manila. Aquino also said in an interview with The Associated Press that a government-backed mission to scout Philippine-claimed waters for oil and gas had turned up “very good” prospects, though he declined to elaborate. He said the Philippines reserved the right to explore its waters despite China’s rival claims. “The overall strategy, we’re not going to engage in an arms race with them. We are not going to escalate the tensions there but we do have to protect our rights,” Aquino said. The Philippines already has protested over six or seven incidents involving alleged Chinese intrusion into waters that Manila says belongs to it because they lie within its 200-mile (320-kilometer) exclusive economic zone that is covered by the UN Convention on the Law of the Sea. The UK-based Forum Energy PLC, which has a contract with the Philippines government to explore the Reed Bank, has announced that it has completed seismic tests in the area and will process the data to identify the best location for drilling appraisal wells. Forum Energy Robin Nicholson said in a statement in March that his company is looking forward “to making further investments into the project.” The company said that in 2006, a seismic survey in an area in the Reed Bank indicated it contained 3.4 trillion cubic feet of gas. in the South China Sea In July 2011, the Philippines and China have agreed not to let disputes in the South China Sea affect friendly relations. After Philippine Foreign Affairs Secretary Albert del Rosario and Chinese Foreign Minister Yang Jiechi held talks in Beijing the two countries issued a joint statement that read: “The two sides reaffirmed their commitments to respect and abide by the Declaration on the Conduct of Parties in the South China Sea...Both ministers exchanged views on the maritime disputes and agreed not to let the maritime disputes affect the broader picture of friendship and cooperation between the two countries.” Chinese Vice President Xi Jinping described the meeting as “productive”. In August 2011, Philippines President Benigno Aquino met his Chinese counterpart, Hu Jintao, during a four-day visit to Beijing. The two leaders agreed on the need for a binding code of conduct in the sea. Aquino told Hu of his wish that the territorial dispute be settled with a “regional” solution. “President Aquino initiated (the discussion on the West Philippine Sea) and he mentioned that we have differences but these differences should not deter us from moving forward. The President also mentioned the position of the Philippine government or the Philippine side, because this is a regional problem, it requires a regional solution,” a Philippines government spokesman said. “On the side of the Chinese, they also mentioned that they continue to hold their consistent position that it should be resolved peacefully and they would encourage that the region be developed or the South China Sea be developed as a sea of friendship, peace and cooperation. So both sides were very positive in addressing the issue in the South China Sea,” he added. China has not objected to a big existing natural gas field off Palawan developed by a state-owned Philippine company, Shell and Chevron but has demanded that Manila stay away from potential energy wealth in the nearby Spratlys. The Department of Energy in Manila is nonetheless now taking bids for 15 new offshore exploration blocks, three of them in or near contested waters. The Malampaya gas field is to the east of Palawan island in an area of the South China Sea not claimed by China. The $4.5 billion Malampaya project, estimated to hold 2.7 trillion cubic feet of natural gas and 65 million barrels of condensate, is operated by Shell Philippine Exploration (RDSa.L: Quote), Chevron Philippines and state-owned PNOC Exploration Corp . In June 2011, the Philippines said it expected to award next year 15 contracts for oil and gas explorations requiring total investments of at least $7.5 billion, most of them in the Palawan and Sulu Sea areas. The Philippines claims it has the sovereign right to explore for oil and gas deposits on its own in the sea's Reed Bank section. The Philippine energy department has announced plans to auction off areas of the South China Sea for oil exploration, despite worsening territorial rows with China, which prefers bilateral talks on the disputes. Ismael Ocampo, the department’s director of energy resource development for the Philippines, told the Washington Post he’d like CNOOC to make a bid as that would mean Beijing acknowledges Philippine jurisdiction. But, with that unlikely to happen, he’d prefer a big American firm as “they have an armada of battleships” behind them. The Filipino plan drew an angry response from China's official media, which accused the Philippines of violating a 2002 declaration between China and the Association of Southeast Asian Nations for self-restraint on the dispute. A China Daily editorial on Friday pointedly singled out the Philippines as it said the Chinese government would not allow its territory to be nibbled away. "There could well be a high price to pay for any misjudgment on the South China Sea issue by countries like the Philippines," it said. In August 2011, AFP reported that Philippine Foreign Secretary Albert del Rosario warned that China's bold claims of control over the South China Sea are one of the biggest threats to peace in Southeast Asia, The threat concerns not only the rival claimants to the hotly contested area, but also all other entities using the waters for shipping, he said in a speech at a Manila university. "If Philippine sovereign rights can be denigrated by this baseless claim, many countries should begin to contemplate the potential threat to freedom of navigation in the South China Sea," he said. "The imperative to speak frankly was borne out of an enormous sense of exigency and urgency... to one of the greatest threats to the stability of our progressive Southeast Asian neighbourhood." Del Rosario repeated calls for UN arbitration on the disputes and for all claimants to jointly develop disputed sections, while asserting Manila's sovereign right to explore for oil and gas deposits on its own in the sea's Reed Bank section. The mission to Pagasa Island was organized by a left-wing legislator, Walden Bello, who, after years of criticizing the United States, now worries more about China. “Just look at their maps and you say: “My God, how do they come up with these claims?”---Bello said. He sponsored a motion in congress for the South China Sea to be called the West Philippine Sea. Dozens of Filipino troops and sunburned villagers welcomed the four-member congressional delegation on Pag-asa Island. "This is a historic moment for the congressional delegation. This is Philippine territory," Bello told a small crowd of residents, government officials and troops who greeted him in the intense tropical heat. Bello carried two new Philippine flags for the island. He and the others sang their national anthem during a flag-raising ceremony in front of a small one-story town hall on the 91-acre (37-hectare) island, which also has a military camp and a small civilian community of about 60 people. 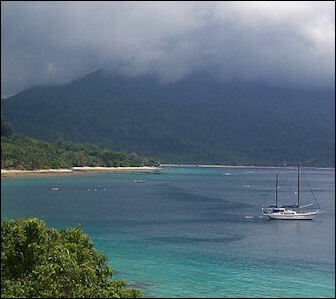 Pag-asa, internationally called Tithu Island, lies in the South China Sea about 300 miles (480 kilometers) west of the western Philippine province of Palawan. Kalayaan municipality was established in 1978. Chinese Embassy spokesman Ethan Sun said Tuesday that China would relay its "great concern" to the Philippine government over the lawmakers' trip. He said it goes against the spirit of a 2002 accord between China and ASEAN, which is nonbinding. The trip "serves no purpose but to undermine peace and stability in the region and sabotage China-Philippine relationship," Sun said in a statement. Bello said that the trip, which his party calls a "sovereignty mission," aims at peacefully asserting the Philippines' claim to Pag-asa and surrounding territory. "We come in peace," he said in a speech on the island. "We support a diplomatic solution, but let there be no doubt in anybody's mind, in any foreign power's mind that if they dare to eject us from Pag-asa, if they dare to eject us from our rightful territories, Filipinos will not take that sitting down. Filipinos are born to resist aggression. Filipinos are willing to die for their soil." In July 2011, the Philippine Star newspaper report that the Philippine navy would soon complete a shelter to "protect troops guarding and securing the country's maritime domain" on an island claimed by both countries. The shell-like structure the navy began building in May is on an island called Patag by the Philippines and Feixin by China -- part of the Spratlys chain which is also wholly or partially claimed by Vietnam, Brunei, Malaysia and Taiwan. In August 2011, the Chinese media on Friday warned the Philippines against building up its military presence in disputed areas of the South China Sea, amid a deepening rift between the two countries. A strongly worded editorial in the China Daily accused Manila of infringing "China's territorial integrity" and said the Philippines could pay "a high price" for misjudging the issue. The Philippines was "not taking seriously" an agreement struck by Beijing and Association of Southeast Asian Nations members in Indonesia last month "to solve the maritime disputes in peace", the English language newspaper said. The editorial came after the Philippine Star’s report that the troop shelter. "What Manila has done not only constitutes an infringement of China's territorial integrity but also runs counter to ASEAN's stance and the spirit of the guidelines," for implementing ASEAN's 2002 Declaration on the Conduct of Parties in the South China Sea. "There could well be a high price to pay for any misjudgment on the South China Sea issue by countries like the Philippines," the editorial said. In September 2011, Reuters reported, the Philippines said it will buy helicopters and build radar stations to strengthen its defence of oil and gas assets located near an area of the South China Sea also claimed by China. Budget Secretary Florencio Abad said in a statement 4.95 billion pesos ($117 million) of royalties from the Malampaya gas field off Palawan would fund the military upgrade. "(It) will fund necessary capability requirements of the Armed Forces of the Philippines in its territorial defence operations, including providing a strong security perimeter for the Malampaya Natural Gas and Power Project," Abad said. Abad said the fund would allow the air force and navy to purchase six new search-and-rescue and patrol helicopters to guard Malampaya and other oil-and-gas exploration areas in the Reed Bank and Sulu Sea. The air force will develop a small helicopter base on Palawan, and the navy will set up four coastal radar stations to monitor ship traffic and help prevent intrusions into the country's exclusive economic zones, Abad said. Washington, a long-time ally of the Philippines and wary of China's military build-up, has promised to provide secure communications and surveillance equipment to four coast watch stations that will track surface movements in disputed areas in the sea. Washington has a 20-year-old mutual-defense treaty with Manila . 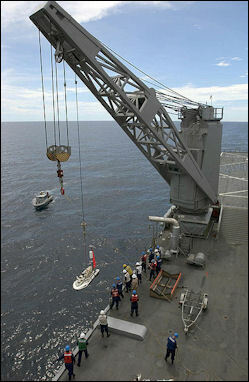 In April 2011the Philippines bought what is now its navy’s biggest vessel: a 40-year-old former U.S. Coast Guard ship. Washington threw in a new weapons system for free. About $10 million had been spent on refurbishing the Hamilton-class navy frigate. 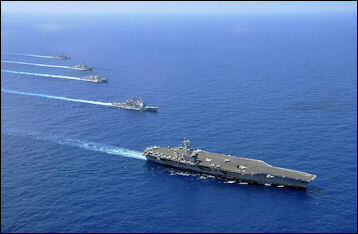 Manila may get two more Hamilton-class ships by early 2012. The new vessel’s main job will be helping Philippines’s Western Command boost patrols off the coast of Palawan, a narrow, 265-mile-long island that juts into the South China Sea. Some politicians even want the United States to reestablish military bases in the Philippines---20 years after Manila, in a burst of nationalist ardor at a time when few here paid much attention to China, booted out the U.S. Navy and Air Force. “We need the U.S. to come back. The U.S. needs to come back, too,” said James “Bong” Gordon Jr. , the mayor of Olongapo, the town adjoining Subic Bay, which until 2001 housed a sprawling U.S. naval base. Lt. Gen.Sabban and Mitra, Palawan’s governor, scoff at the idea of the United States setting up again in Subic Bay but say it should take a look at Palawan, much closer to possible flash points in the Spratlys. China has used arcane issues of international law and ancient shards of pottery as evidence of its “indisputable sovereignty” over the South China Sea. Some date the dispute back to 1947, when the doomed Chinese government of Chiang Kai-shek issued a crude map with 11 dashes marking as Chinese almost the entire 1.3 million-square-mile waterway. The Communist Party toppled Chiang but kept his map and his expansive claims, though it trimmed a couple of dashes. Beijing and Manila both claim sovereignty over Scarborough Shoal---an uninhabited, horseshoe-shaped shoal of coral reefs and islets, which lies more than 800 kilometers from the Chinese mainland and 230 kilometers off the northern coast of the Philippines, well within a 200-nautical-mile “exclusive economic zone” provided for by the U.N. Convention on the Law of the Sea. The Philippines insisted the Chinese fishing vessels were inside the Philippines EEZ near Scarborough Shoal and were poaching. The Chinese ships prevented the Philippine navy from detaining Chinese fishermen. There were initially eight Chinese fishing boats seen in the area, but the number increased to 12 at one point, said Lieutenant General Anthony Alcantara, the regional military commander. The standoff broke up after several weeks without a resolution of the underlying legal issues. Separately, the Philippines decided to begin drilling for natural gas in the Reed Bank near its Palawan Island, a program to which China objects. Foreign Affairs Secretary Albert del Rosario confirmed that the Chinese fishing boats departed from Scarborough Shoal, but that China sent back one of its surveillance ships to the shoal, bringing to two the number of vessels facing off a Philippine coast guard frigate. He also accused China of flying an aircraft near the Philippine frigate, and said that a “white Chinese ship harassed a Philippine-registered vessel with nine French nationals, which has been conducting archaeological surveys.” “It appears there is an element that is lacking in our negotiations. I seek a deeper element of trust from our Chinese friends,” del Rosario said. He said that his meeting with Chinese Ambassador Ma Keqing night “resulted in a stalemate,” with both sides insisting that the other nation’s ship be the first to leave the area. Chinese surveillance ships continued to remain on the area of Scarborough Shoal after the fishing boats left. Manila says Half Moon Shoal falls well within its 200-nautical-mile exclusive economic zone, as recognized by international law. "The incident in Hasa-Hasa shoal makes us nervous," Rommel Banlaoii, executive director of Philippine Institute for Peace, Violence and Terrorism Research, told Reuters, referring to Half Moon shoal in the Spratlys. "I think what happened there was an accident, but we don't want such accident happening again because it could trigger something that all claimant states do not want to happen there." Fabius's story reads like a parable about contending strategic paradigms. Soldiers typically covet decisive engagements that yield clear results along with renown for the victors. That means offense. But Fabius was an atypical, defensive-minded soldier. Rather than risk everything in offensive actions, he mastered the art of lurking near superior enemy forces yet shunning decisive battle, waiting and watching until ideal circumstances arose. Only then, when the risk was low and the likely gains high, would he undertake major combat. But the longer an impasse with a sorely outclassed rival drags on unresolved, the more the stronger antagonist starts looking both bullying and irresolute -- the worst possible outcome in power-politics terms. Although militarily, China can do what it wants at Scarborough Shoal, the controversy looks increasingly like a political loser for Beijing. During the 2012 confrontation between China and the Philippines in South China Sea in 2012 Chinese travel agencies suspended tours to the Philippines, and the government has stepped up quarantine inspections on bananas grown in the Philippines.